In 2015-16, over 200 farmers committed suicide in Odisha. This year, five have taken their lives in quick succession. Is there no way the government can check farm distress? On February 28, 2017, Khainu (Hadu) Bagarti, a farmer from Bargarh district of Odisha, died at the Burla government hospital. Burdened by crop failure and debt, he had consumed pesticide. This was spoken of as the state’s first farmer suicide of the year, as if it were a distinction. But the alarm has been ringing for some years now: in 2015-16, according to media reports, there were more than 200 farmer suicides. And as if Khainu Bagarti’s death were an omen, seven days after his death, Shiv Prasad Botra, a farmer from Navrangpur district, committed suicide, again by consuming pesticide. According to his wife, it was because of the failure of the kharif crop. Three more cases followed: Ballav Dharei of Boudh district, Sudam Khatua from Balasore, and T Bulu Reddy from Ganjam. And at the time of filing this report, Kaling Ghadai, a farmer from Jajpur district, was struggling for his life after having consumed poison. It’s not as if political leaders weren’t aware of the problem. Congress vice-president Rahul Gandhi had visited the worst-hit Bargarh district in September 2015 to lead a ‘Save Farmers’ march; two months later, chief minister Naveen Patnaik announced a series of measures – a drought relief package, easy crop loans, and Rs 35,000 crore for the development of western Odisha – to help farmers; and in February 2016, prime minister Narendra Modi at the Krishak Samavesh in the district. But these high-profile visits and announcement of schemes did nothing to prevent the suicides of farmers like Khainu Bagarti and others. Congress leader Narasingha Mishra brought a privilege motion against the agriculture minister, accusing him of misleading the house. He told Governance Now: “The government does not accept the cases of farmers’ suicide. After the Bargarh and Navrangour suicide cases, another case of farmer suicide is being reported from Ganjam district. A group of advocates visited Khainu Bagarti’s family and confirmed it was a farm-related suicide. The victim suffered from crop loss and there is proof of debt burden on him. We demand an inquiry by the special house committee or it should go to the privileges committee of the assembly.” State BJP chief Basant Panda threatened to stage demonstrations in all district headquarters to demand the minister’s dismissal. On March 15, 2017, Maharathy, speaking in the assembly, quoted NCRB data that as many as 1,895 farmers committed suicide in Odisha from 2005 to 2014: 254 in 2005; 283 in 2006; 240 in 2007; 260 in 2008; 154 in 2009; 162 in 2010; 144 in 2011; 146 in 2012; 150 in 2013; and 102 in 2014. The NCRB didn’t have figures for 2015 and 2016. 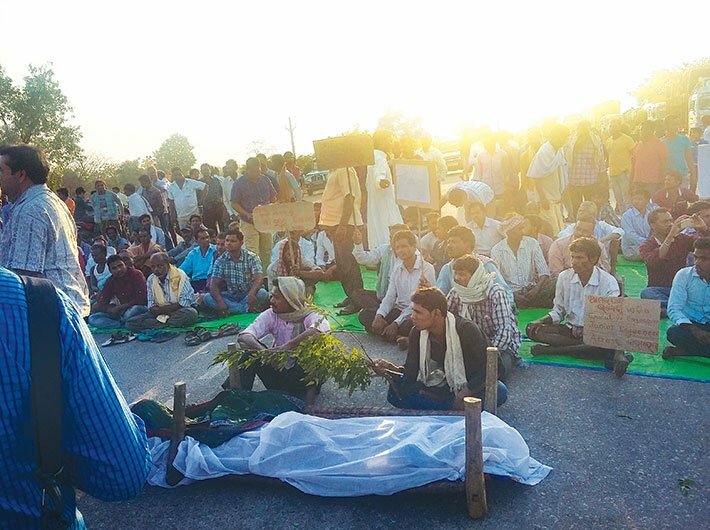 Amitabh Patra, an activist from Bargarh, told Governance Now: “The first highlighted case of farmer suicide dates to 2000-01, when Babu Rao, a farmer of south Indian origin from Bargarh district, set himself afire in front of the collector’s office. Private rice mill owners who’d bought his paddy had delayed payment.” Most farmer suicides were from western Odisha, a semi-arid region, but in 2015-16, suicides were reported across the state owing to drought. Lingaraj Pradhan, convener of the Pashcim Odisha Krushak Samanwaya Samiti and a prominent activist, listed the causes of agrarian distress. “The first reason for farm distress is that the farmer does not get enough returns for his produce. The input cost for products like fertiliser, seeds, water, pesticides and labour has gone up, but the selling price of paddy, vegetables etc has not proportionately increased,” he said. Post-liberalisation, particularly after 2000, government subsidies for fertilisers, pesticides, power for irrigation and so on have been reduced so the cost of farming has gone up. On average, input cost has risen four-five times in ten years, but the minimum support price (or MSP, at which the government purchases farm produce) has not kept pace. Expenses on health and education have gone up, forcing farmers into debt. Equally linked to the farm crisis are unavailability of cheap credit, abysmally low MSP, distress sale of farm produce owing to non-availability of cold storage, lack of irrigation facilities, and ineffective crop insurance. Loan crisis: In 2009-11, several women from farmers’ families committed suicide because they could not repay loans to micro-finance institutions. These institutions were charging 36-48 percent annual rate of interest, plus hidden costs. If they had borrowed from money lenders, the rates would have been even higher – 48-120 percent annually. Cooperative banks offer loans at 5-7 percent, but many farmers, especially share-croppers, are unable to avail of such loans as they don’t have the requisite paperwork. Besides, for the poor, getting loans involves middlemen who charge their cut. MSP blues: The government procures only 34 to 38 percent of the paddy produced, according to its own data. The rest is sold in the open market. In 80 percent of cases, the farmers did not take recourse to selling the produce to the government because of the cumbersome procedure and the delays involved, according to a study by the Indo-Global Social Service Society (IGSSS). Private traders, on the other hand, arrive at home to pick up the produce and offer immediate payment. By selling in the open market, a farmer loses '200-400 (the MSP for paddy in 2016-17 was Rs 1,470). Private millers and procurement officials work in tandem to make a mess of the system, forcing farmers into distress sales. Poor irrigation: Farmlands in western Odisha are largely rain-fed. In some places, there are bore-wells which have been sunk through government-farmer partnerships. Some farmers continue to use traditional water-harvesting structures. Power supply is a big issue. “In almost 90 percent of cases in Bargarh district, watershed management structures are a waste. Corruption is rampant in these schemes,” said Amitabh Patra. “In one village, there are about 300 deep borewells but most of them don’t work, leaving about 1,000 acres dry.” As per government figures (2008-09), only 34 percent of the 61.8 lakh hectares of cultivated land in Odisha is irrigated during the kharif season. No crop insurance: The government now offers compensation for crop failure under the National Crop Insurance Programme at the village level (earlier it was at the block level). An additional programme, the Prime Minister Crop Insurance Scheme, was launched in February 2016. But studies suggest it takes more than two years for farmers to get compensation. In case of share-croppers, it’s the land owner who gets the compensation. This is often disastrous. About 83 percent of farmers in Odisha are small and marginal farmers. Then there are landless labourers who till others’ land as share-croppers. But these share-croppers hardly get any benefits from the government. The agro-policies of the state should centre on small and marginal farmers, and tenancy laws should be amended to allow landowners to lease their land for farming to others without the fear of losing their land. Procurement should be streamlined and compensation for crop loss should be provided in a time-bound manner. “Traditional watershed structures must be rejuvenated for irrigation. This is possible under MGNREGA and other schemes if there is political will and if corruption is minimised. Good agriculture can prevent distress migration in western Odisha,” says Sanjay Mishra, an activist working on distress migration and member of the state social security board, based in western Odisha.